After several months of lethargy I finally quit smoking a couple of days ago. 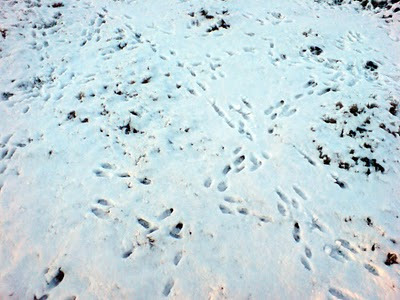 Today, to my surprise, I discovered a keen wish to go out in the fields - so out I went (at about 2.00pm). So I did just that: I sat around, looked up into the sparkling, leafless trees, took pictures of the landscapes around me, sipped coffee from a tiny flask and squeezed my little lighter-fuel-powered hand-warmer in order to try and keep my fingers from freezing. 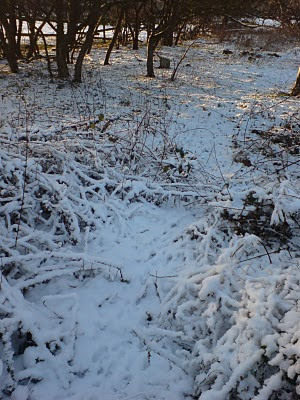 ...where I sat on a log while I peered out at a motionless, snow-crowned hedgerow. Half-a-dozen little grey wagtails dipped and flitted along it towards me. A flash of red above me - a woodpecker? Black, white and red? I must look that up when I get home, I thought. All very pleasant and interesting; but I got colder and colder. A pigeon landed above my head; I tried to raise the rifle silently and slowly - but it saw me and clattered off into the frosty sky. More time passed by; the coffee ran out, my hand warmer went out and it was still nowhere near to going dark. I was beginning to think that, willing as the spirit was, my poor shivering flesh might well petrify before dusk. A while longer and I though, 'actually, I'm so cold that I'm starting to not even feel cold any more'. Spooked by this, I creaked to my feet and started for home. Walking back, my hands began to hurt so much that I was emitting misty blue clouds of earnest cursing as I padded across the fields; it was certainly the coldest I've ever managed to get when out hunting - but, swearing aside, I enjoyed it: it was a great relief to be out in the air again after months of fags and fug. Glad to see your out and about again. Better luck next time. Have been following your blog for nearly a year with great joy and interest whilst learning in parallel, the art of the Sporting Airgunner, with a pre '89, Venom Tuned HW77k .177, enjoying similar experiences to yourself, ie. frustration, optimism, pessimism, hunger and occasionally great success!! Having noticed your plea for a soulless PCP, i was wondering if you had seen the ads on The Hunting Life forum? I saw an Air arms S410 TDR, ideal for your cycle ride to and from, for round about £250, if you were to trade in your HW 80 (and your soul!). I would love to donate but I understand I can't put pocket fluff through pay pal, as I've just bought an S410 tdr myself! Also,in these snowier months, I've had quite a deal of success with Pigeons by decoying around sitty trees and potting the them from there. I figured that the money i spent on decoys was easily recouped from not spending it at the meat counter! I look forward to further updates on your great adventure! Glad to see another post Sir! I really enjoy your posts and intresting takes on life! Hi all, Yep, Hubert stirs from his warren to venture outside and - phew! - gets a little chilly! Thrilling stuff here on the blog - oh yes. Welcome Derek, Eric and JKC! I suspect I could get my hands on some sort of PCP if I flogged the Weihrauch Warhorse but that's not the way I feel as though I want to go about it, somehow - we'll see what happens. The decoys do seem like a good idea - I was vaugely thinking of running up a few home made ones. Perhaps now that nicotine is being replaced with oxygen in my bloodstream I'll find the motivation for these little projects? More posts on the way, SBW, promise! Hello Hubert, Glad to hear that you're breathing o2 for a change, great post I can feel the chill in my bones just reading it! Take care my good man. Very glad to hear that you have quit smoking Hubert, well done. Stick with it, it is well worthwhile, believe me. Good to hear you've ditched the butts. Thans folks! Yep, three weeks in now and only a few (well, on reflection actually, several) hysterical tantrums as a result of quitting. Best of luck to you Eddie! I read Allen Carr's 'Easy Way to Quit' book and it helped a lot - in fact it's invaluable.